Subscribe to the Flexible Packaging Blog! Subscribe to Our Blog and Get the Shrink Film Cheat Sheet, Free!! 6 Tips to Save on Shrink Packaging and How to Implement Them. We all want to save as much time and money that we can with any projects we take on, especially at work. 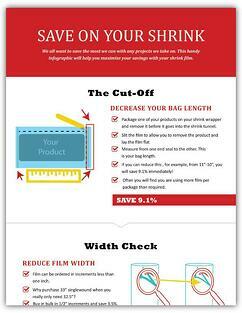 Use this handy infographic to help maximize your savings with your next shrink film project. What is your cutoff? Save 9.1% or more with this tip. Are you using the appropriate film width? Save another 3.5% or MORE. Fill out the form to the right to get your free copy!